There were definitely some tough calls. 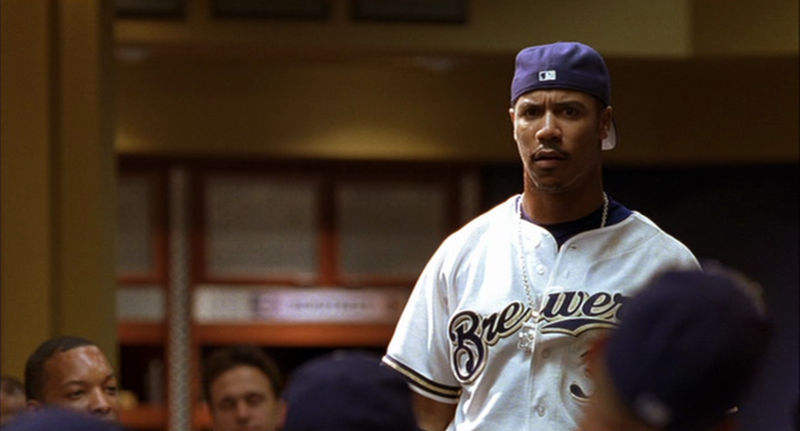 For starters, finding a second baseman or basewoman who got any on-screen time was hard to find. 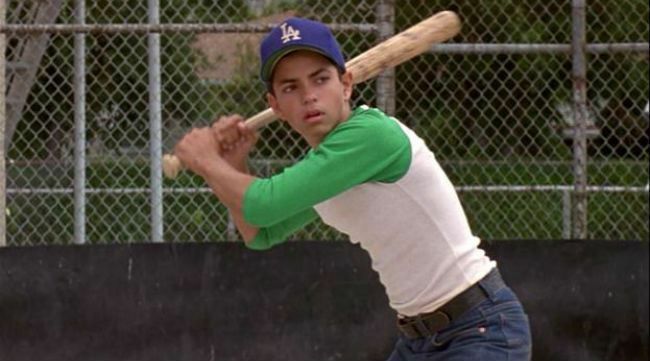 Also, does anyone even know what position Benny ‘The Jet’ Rodriguez played? The producers of the Sandlot really dropped the ball assigning Benny a role on ‘D’. We went back and forth on position players for hours. Still, it was no where near as difficult as filling our 5-man rotation. It’s like going into a candy shop and only being allowed to pick a certain amount of things. You want it all. So, after much debate, we expanded the pitching staff to include a relief pitcher, closer, and pitching coach. It’s now time to introduce the 2018 JustBats Ultimate Fictional Baseball Team! Remember when Willie came to tryouts in his pj's? Or, when Hayes bought a pair of batting gloves for each base he stole and then hung them on his wall? This guy has heart and he's got speed. Welcome to the leadoff spot, Willie. We believe the general population owes Lou Collins a second chance. It was Lou versus the Big Unit, bottom of the 9th, in a win or go home situation. We all thought Collins would deliver the big hit especially with everything sports movies had ever taught us in the past. But, no, Collins is robbed at the wall by Ken Griffey Jr. and the Twins and the viewers go home with an emotional loss. "The Jet" has everything you're looking for in a 3 hitter. He's got the speed, power, brains, and is hands down the most talented ball player in the greater San Fernando Valley area. He's got the stamina to outrun the beast and the charisma to be the face of the franchise. Some consider Benny a SS, but, the writers at JustBats are penciling him in as our stud designated hitter. How many fictional baseball players do you know who are on the cover of a video game? One, and he goes by T-Rex Pennebaker. We saw first hand what can happen when you rally together as a team. 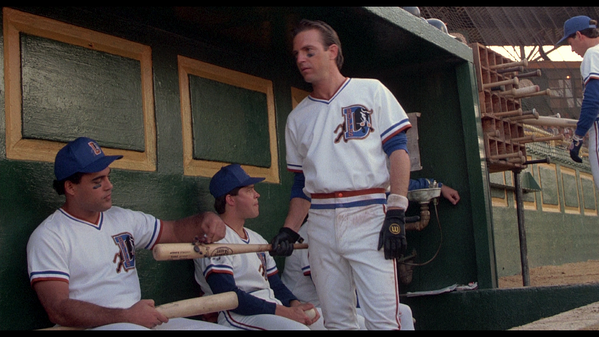 Pennebaker took over that clubhouse and showed his true colors becoming the team leader. Pennebaker put up massive numbers including a .330 average and 50 home runs and is well deserving of the cleanup spot. Rob is our clubhouse veteran. We need Roy to keep the guys in check and be the foundation of this team. Hobbs is our most clutch player in the lineup. He'll play catch with the fans in the stands then step up to the plate in the 9th with a broken bat and put one in the lights. Mr. Hobbs will hold down the 5 spot. The switch hitting catcher hit his 20th home run of the 1988 season to break the all-time minor league home run record. 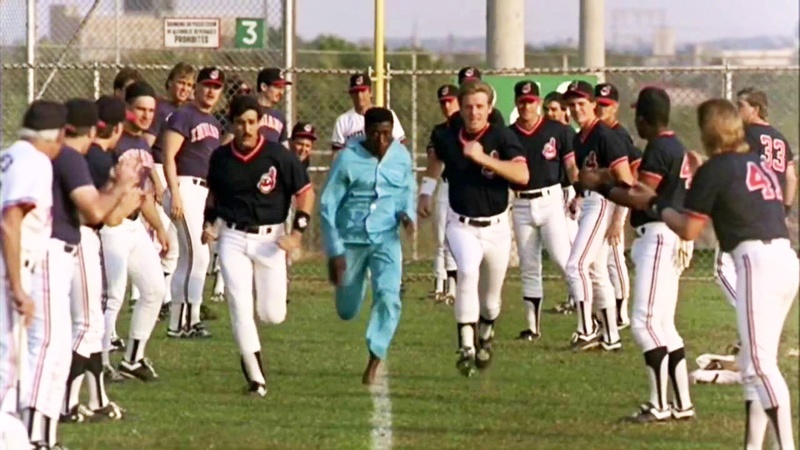 The best part, he went oppo-like-taco through the shadows behind the left-field wall. When asked about the historic feat, Crash said, "I’m just happy to be here. Hope I can help the ballclub,” This is the type of guy we want on our team. Dorn received a lot of heat during his time with the Indians. He let money, endorsements, and fame get in the way of what could have been a promising career in Cleveland. Still, Dorn stepped up on many occasions. He took countless balls to the chest at third, we brought us "hats for bats", and his single led off the rally for Cerano to tie the game in the 7th against the Yankees. 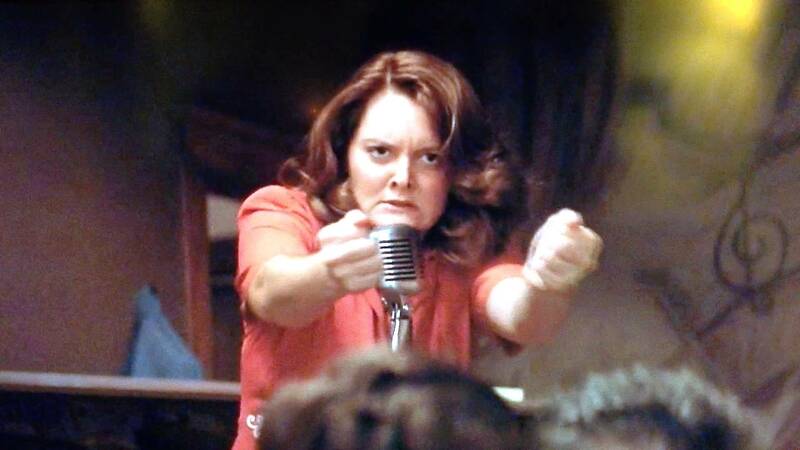 Marla Hooch would have been one best players in the Major Leagues if she was a boy. Hooch deserves a spot on this roster. She's got it all: Hooch throws right and hits left. She hit the ball all over the gym during her first tryout with the Rockford Peaches. We saw Hooch grow not only as a player, but maybe even more as a person. We expect big things from Hooch in the future. 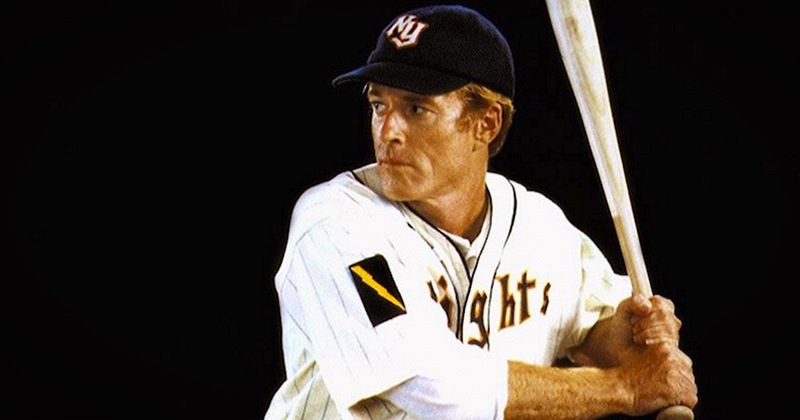 Alan McClennan was a member of the Sandlot team in 1962 and he'll hold down the 'second leadoff' spot for the Justbats Ultimate Fictional Baseball team. Yeah-Yeah played a key role in orchestrating a plan to retrieve the ball from the beast. Although it was ultimately a failure, you have to respect the effort. Yeah-Yeah would grow up and attend one of the finest military schools. We'll take hustle and discipline from a 9 hitter all day long. 17 years later and the death of G-Baby is still etched in our hearts. He was funny, courageous, and real. He stood 4-foot-nothing, but his presence was colossal. G-Baby was the heart and soul of the Kekambas and he'll be heart and soul of the JustBats Ultimate Fictional Baseball Team. 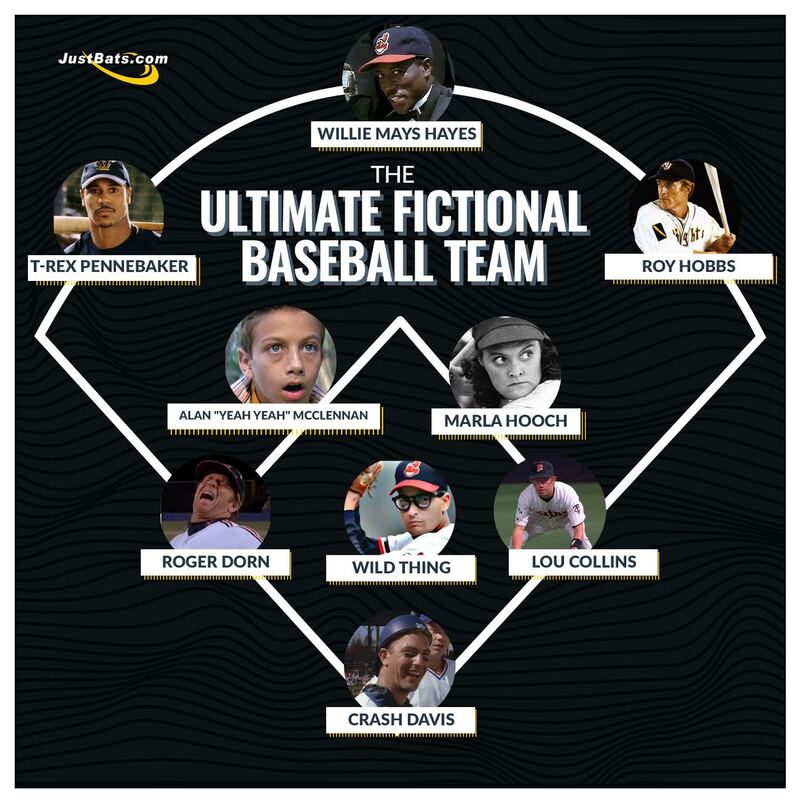 What do you think about the JustBats Ultimate Fictional Baseball Team? What would you change? Who would you add or cut? We think this team has a shot at the pennant. We’ve got both speed and power in the outfield, veteran infielders, and one of the most electric arms coming out of the bullpen. As long as Brickma keeps heating up those ice cubes, I like our chances.